HOLLYWOOD | Juan Guerra has been a pro-life activist, a therapist, an administrator, even a landlord. Maybe he's been training all his life for his new job: executive director of the archdiocesan Respect Life Office. Juan Guerra poses at the entrance of the South Broward pregnancy help center. It's part of the archdiocesan Respect Life Office, where he's the new executive director. At Respect Life, Guerra succeeds Joan Crown, who retired after 37 years at its helm. He realizes hers is a tough act to follow. Born in Havana to a devout Catholic family, Guerra grew up in Philadelphia, where he earned a master’s degree in psychology and art therapy at Hahnemann Medical Hospital. He worked during the early 1980s as a therapist at a state hospital in Pennsylvania. He got involved in pro-life causes as well: He helped open a crisis pregnancy center and worked with Operation Rescue. He was even arrested, often for blocking abortion clinic entrances while playing guitar and praying the rosary. That’s where he met Mary Kate, a fellow pro-life activist. “A beautiful woman, inside and out,” he recalled. In the late 1980s, Guerra went to Honduras for a year, helping launch an orphanage under the auspices of Our Little Brothers and Sisters. But back in the states, he met Mary Kate again at a Christmas party. Two years later, they married. They came to Miami in 2002 to represent Friends of Orphans, supporting two orphanages in Haiti and the Dominican Republic. After five years, they returned to Philadelphia, where he worked with ACLAMO Family Centers, which served mostly Mexican immigrants. This past June, he visited a friend’s house during the veneration of a glove once worn by Padre Pio. He asked for the saint’s guidance in his career. The next day, he said, Mary Kate found the South Florida job posting online. That brought them back to Miami. 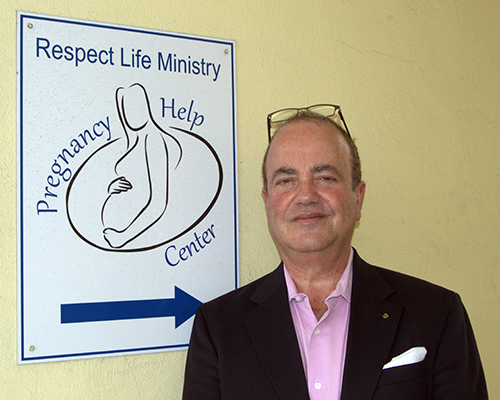 In Respect Life, Guerra inherits an organization with five pregnancy help centers around the archdiocese that help 1,000 people per month, mainly women. Their services range from providing diapers and baby food to ultrasound screenings to classes in childcare. If the mothers can't afford to keep the children, the centers also offer adoptions. 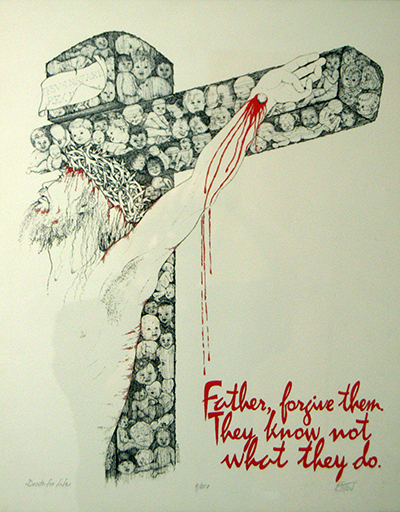 Picture at the archdiocesan Respect Life Office shows unborn children on the cross with Jesus. The organization’s Project Rachel counsels women who have had abortions. Its Project Joseph, a partnership with the Franciscans of Life, works to heal men who have been part of abortions, and helps guide them in the ways of fatherhood. Respect Life’s 12 paid staffers coordinate more than 200 volunteers. The volunteers serve as liaisons with parishes and as public speakers on pro-life issues including chastity education and the death penalty. Other laypersons may pitch in for tasks like running booths at fairs and festivals. Guerra said he’ll keep several longstanding practices at Respect Life, such as daily prayer in the headquarters chapel. The devotions include a decade of the rosary, a prayer to St. Michael and intentions of the day. The headquarters includes images of both St. Michael and Our Lady of Guadalupe. He also plans to continue Crown’s cooperation with pro-life work in parishes, talks with legislators for pro-life laws, and outreach in high schools and colleges. He plans to use TV, radio and social media as well. Abortion has been a longtime concern of his, Guerra said. He was 16 in 1973 during the Roe v. Wade case, when the Supreme Court declared the practice constitutional. But he still talks in terms of tragedy and urgency. He even blames abortion partly for the climate of “coarseness, hardening, lack of civility and humanity” in society. “I believe abortion contributes to it. A lot of people are carrying a lot of pain. The tragedy is more than the mother and child. It’s also the boyfriend, the husband, the grandparents, the friends that counsel and accompany and participate in the whole experience. “The culture of death is very strong in America. If you have something imperfect, the solution is to take a life, rather than assist the mother and the child. We want to offer loving solutions, rather than death,” he said. The Guerras even have direct experience in a crisis pregnancy. When Mary Kate was carrying her fourth child, a doctor in Miami said he detected a “small genetic abnormality” in the fetus. The doctor was wrong: Angela was born a “beautiful, healthy daughter,” Guerra said. She's now 10. The Guerras have taken up residence in western Miami-Dade, attending Prince of Peace Church. He plans to serve there as an extraordinary minister of the Eucharist, a post he filled in Philadelphia. He also tries to encourage a pro-life ethic there – and everywhere else. Guerra said his aim is not only to serve but to change the public image of pro-life people. “People often associate the Respect Life office with people who want to outlaw abortion and subjugate women and control people’s lives,” he complained. “We do want to stop abortion, to fight back the tide of death. But everyone who becomes involved meets the most amazing people who live exemplary lives. Guerra acknowledged that it all adds up to a “lofty” mission, and he acknowledged that the Respect Life Office can't do it alone. Juan Guerra, the new executive director of the archdiocesan Respect Life Office, shows a storeroom for baby care supplies. We are so happy to have you with us, Juan! May God bless all that you do in Miami. Welcome to the family!